I love the Transformers cartoons when I was a kid. 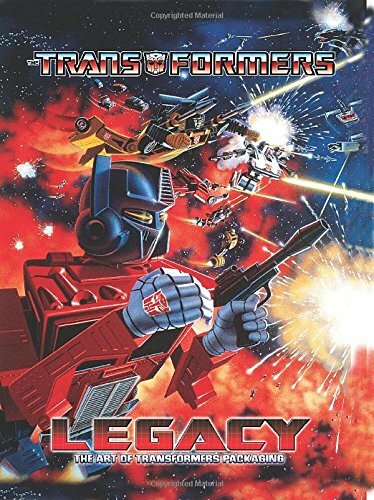 The only toy that I had was an Optimus Prime toy (shown in the book) which was a hand-me-down so I don't even know how the packaging art looks like. But this book really reminded me of the good old days of watching the cartoons. Transformers Legacy large format 296-page hardcover artbook authored by Bill Forster and Jim Sorenson. The amount of work they did in curating 750+ artworks in this book is incredible. As mentioned in the book, Hasbro did not retain the original art for the packaging back in those days. So the authors had to look for original art, photo negatives, style guides and other sources that could provide the quality that holds up to print. No scans were used because the conditions of old boxes were usually too lousy. As a result, the reproduction quality of the artworks quite good. To see all these packaging art in one book is quite amazing. There are so many of them. It's quite fun just looking at all the interesting names of the Transformers. Most of the artworks show just the robot versions. Also included are a handful of concept art drafts. There are also a few double page splash art with massive battle scenes of showing transformation in progress. The few chapters included are quite brief with only introductions. Chapter 1 starts off with the Classic Era, toys introduced in the 1984 and 1985. Chapter two has the toys from 1986 to 1988 excluding some sub-lines. Hasbro transitioned from toys licensed from Japanese companies to creating their own. Chapter Three covers Scramble City, the Japanese name for the teams of interchangeable combiners. There are seven groups that form the product lines from 1986 to 1988. Chapter four covers the Nebulan Era. Headmasters, Targetmasters and Powermasters form the product lines in 1987 and 1988. Chapter Five has the Pretenders. Six has the Micromasters. Seven, the Action Masters. Generation 2 moved towards using more computer generated graphics. In 1996, Generation 2 was cancelled and the Beast Wars line was introduced. The artistic style was very much different from the air-brushed style so the authors used that as a stopping point for the book. Even so, the number artworks already clocked in at about 750 pieces. Basically, there are so many toy lines it can get a bit confusing. I'm not sure if all the toys from the within the time period are included, but then this is already quite an immense collection for the 80-90s toys. This is a truly awesome book for Transformers fans out there, especially those who collect the toys.